I was really happy with both the movies that opened this past weekend Luca Guadagnino "A Bigger Splash" (See separate post) and Jodie Foster's "Money Monster". Jodi Foster is one of those rare individuals in this business who can take long periods of time off and yet continues to command respect, stays relevant and never loses her ability to find and tell good stories. I think Foster also fleshed out the secondary role of Diane Lester (Caitriona Balfe) who plays the right hand and lover of Wall Street Tycoon, Walt Camby (Dominic West). Once Diane sees the severity of the situation, she goes far beyond the talking points given to her by the other corporate heads, to find out the culpability of Camby and their company. Quick T&T Synopsis: George Clooney is Lee Gates, a Jim Cramer type even Jim Cramer would think is over the top. His live cable show uses blaring graphics, hip hop dance routines and hokey props to cover Wall Street, give investment forecasts and generally talk all things stocks and bonds. Gates is not one to stick to the script and often has to be pulled back to topic with a code word given to him by the long suffering Patty Fenn (Roberts) who directs the show. Jack O'Connell (Unbroken click for T&T post) is Kyle, he appears to be a delivery guy who got lost and wandered onto the set, but turns out to be a disgruntled investor who lost his inheritance - $60,000 gotten from the sales of his mother's house, because he listened to Lee Gates who said investing with Camby's company was as good as money in the bank. Only a "glitch" in the system cost the company and it's investors 8 million dollars in loses and Kyle's determined to get more answers - so he takes Gates and the entire show hostage, making Gates wear an explosive vest and making Patti continue to air the show live. 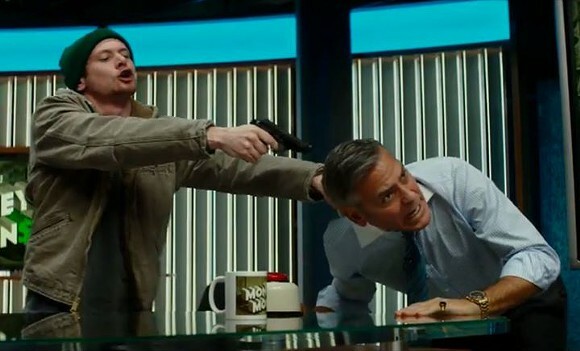 Bottom Line: OK perhaps the movie would have benefited by coming out before The Big Short (click for T&T's post) but I feel Money Monster can stand on its own as a high stakes game of tension, used to make a social commentary on the current state of Wall Street. The Big Short is an intellectual overview of how things went down, using ironic humor. Both good, but one need not take away from the other.